Known as the sunniest city Down Under, Perth is a buzzing riverside metropolis bordered by the Indian Ocean to the west and the ancient Darling Range to the east. Follow our guide for 10 great things to do in the vibrant capital of Western Australia (WA), a youthful city packed with endless beaches, bustling markets, exquisite parklands and a skyline to rival Manhattan. A charming multi-cultural city, Perth is a quietly confident destination - delve into an exhilarating mix of cultures for one of the most memorable holidays Australia has to offer. What: Covering a whopping 1,000 acres atop Mount Eliza, this sweeping parkland overlooks the Swan River and Darling Range and offers awe-inspiring views across Perth’s cityscape. This peaceful oasis is the world’s largest inner city park; nearly two thirds is natural bushland complete with 319 species of native plants whilst the rest is made up of landscaped gardens, grassy spots, picnic lawns and children’s playgrounds. The outdoor entertainment in the summertime is fabulous; grab a deckchair to watch a play or concert under the stars and among the towering gum trees or catch a classic or arthouse movie at the Opel Moonlight Cinema just outside in the Lakeside Picnic Area. Highlights: Free daily guided walking tours of Kings Park depart from Fraser Avenue, outside the Aspects, at 10am, 12pm (from 1 September to 30 June only) and 2pm. A must for nature lovers is the Botanic Gardens, a unique showcase of around 3,000 of Western Australia’s 12,000 species of plants. What: Penguin Island, Perth’s island nature reserve, is a five-minute ferry ride across Shoalwater Bay off the coast of Rockingham, around 45 minutes south of Perth. This is WA’s largest colony of Little Penguins, the smallest species of penguin in the world measuring 43 cm tall. Head to the island’s Discovery Centre where rangers host three daily Penguin Feedings at 10.30am, 12.30pm and 2.30pm. The centre also serves as a sanctuary to care for penguins that have been injured or orphaned. Highlights: There are currently 10 resident Little Penguins at the Discovery Centre, including the oldest Piggy (named for his healthy appetite) and his life long partner Gerry. Rockingham Wild Encounters is the only cruise company licenced to visit Penguin Island and operates within the wildlife sanctuary zone of the Shoalwater Islands Marine Park. Penguin Island is open daily from mid-September to June; it is closed over the winter months to ensure the penguins are not disturbed during their nesting time. What: Occupying two heritage buildings on the south-eastern corner of the Perth Cultural Centre, the Art Gallery of Western Australia showcases over 17,000 treasures, including one of the finest collections of Aboriginal art on the planet. Founded in 1895, the city’s foremost art space houses permanent and rotating displays by Australian artists and designers and also includes Western Australia’s State Art Collection, an inspiring mix of indigenous, historic and contemporary works. Highlights: Discover the collections and exhibitions at your own pace by following the Gallery Trail brochure or join one of the free guided tours led by an experienced Volunteer Gallery Guide. Take the spiral staircase leading to nine distinct art spaces, some of which display photography, crafts and sculptures by national and international artists. The gift shop, located in the Gallery’s foyer, stocks plenty of art literature, prints, fashion, jewellery, ceramics and plenty of artful delights. The gallery is open from Wednesday to Monday, 10am to 5pm; admission is free. What: At the mouth of the Swan River, just 30 minutes from downtown Perth, the heritage port of Fremantle – known as Freo – has somewhat merged into the area’s suburban sprawl whilst managing to retain its own identity. Established in 1897 and reopened in 1975, the iconic Fremantle Markets are housed in a grand Victorian heritage-listed building on the corner of South Terrace and Henderson Street and have become a weekend must-do for an eclectic mix of Perthites and tourists. Highlights: Tempting with the weird and the wonderful, this fascinating market is truly a feast for the senses. There are over 150 stalls bursting with fresh local produce, speciality foods, homeware, antiques, Aboriginal art and unique offerings from local artisans and crafters. Head to The Hall (Friday 9am to 8pm, weekends 9am to 6pm) to kick back with a glass of wine in the Market Bar and shop for fashion and accessories; head to The Yard (Friday 8am to 8pm, weekends 8am to 6pm) for fresh bread, flowers, wholefoods and fruit and veg. Street entertainers and buskers add to the buzzy vibe. What: Rottnest, or Rotto, is Perth’s idyllic island playground located a 30-minute ferry ride from the city, just 18km off the coast from Fremantle. This car-free paradise boasts plenty of natural beauty with gorgeous beaches, hidden bays, coral reefs for diving and snorkelling, abundant marine life and deserted cycle paths waiting to be explored. The famous furry marsupials that inhabit the island inspired its name; in 1696 Dutchman Willem de Vlamingh mistook quokka’s for ‘a kind of rat as big as a common cat’ and named the island ‘Rotte nest’, meaning rat’s nest. Highlights: There are now typically between 8000 and 17,000 of these much-loved cuddly creatures living on Rottnest, depending on the availability of food and water. For a furry encounter, join the Quokka Walk, a free walking tour that departs the Salt store daily at 1pm. Led by Rottnest Voluntary Guides, this is a great opportunity to learn fascinating facts about Rottnest’s most famous inhabitants and watch them resting within the shade of clumps of low trees around the island. Don’t dare to feed them or else you will be issued an infringement by a Rottnest Island Ranger. What: The Swan Bell Tower, also known as Swan Bells, is a dazzling contemporary copper and glass structure that was built to celebrate the new Millennium. Completed in 2001, this imposing tower is 82 metres high (268 feet) and houses 18 historic bells from St. Martin-in-the-Fields that were gifted to Australia from the City of London in 1988. Located at Barrack Square on Riverside Drive, overlooking the Swan River, this distinctive design marvel is one of Perth’s must-see tourist attractions. Highlights: Hear the bellringers in action as they practice the ancient art of ‘Change Ringing’ between noon and 1pm every day apart from Wednesdays and Fridays. Bell handling demonstrations are held on Wednesdays and Fridays between 11.30am and 12:30pm – visitors can chime one of the ancient St Martin-in-the Field bells and receive a congratulatory certificate. For incredible 360-degree views of the city and the mighty Swan River, take the lift to the Bell Tower Observation Deck on the sixth floor. Admission costs £9.30 for adults and £6 for children. What: Located at the corner of Hay and Hill Streets, the Perth Mint opened as a branch of Britain’s Royal Mint in 1899 both to refine gold from the State’s newly discovered eastern gold fields and to strike gold sovereign coinage for use throughout the Empire. Housed in a grand heritage building with a heavily secured vault and original melting house, Australia’s oldest operating mint offers plenty of activities including free hourly guided walks, gold-related exhibits, demonstrations of the production of gold bullion bars and the chance to handle a 400 ounce bar of pure gold. Highlights: For those who have wondered what your weight is worth in gold, hop onto the Perth Mint’s special weighing scales to find out. Golden highlights include engraving your own gold-plated, pure silver or pure gold medallion and watching a traditional gold pour, when pure gold heated to molten temperatures and transformed into a solid gold bar. There is also the chance to see the world’s largest gold bullion coin, the colossal record-breaking Australian kangaroo coin made from 99.99 per cent pure gold and measuring nearly 80cm wide and over 12cm deep. The Mint is open daily from 9am to 5pm; admission costs £10 for adults and £3.30 for children. What: Perth’s dazzling Indian Ocean coastline allures with around 80km of gleaming sun-kissed white sands backed by crystal-clear deep blue waters. 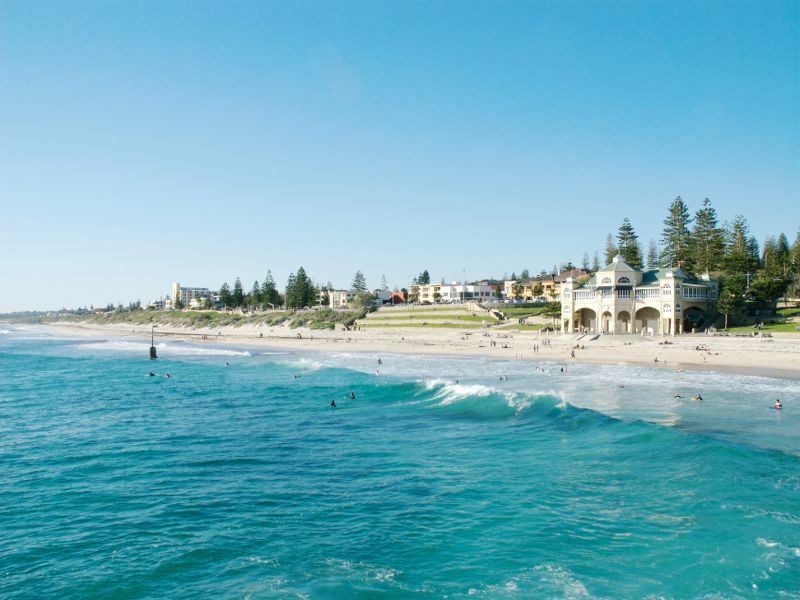 For the ultimate city beach thrill, head to the Cottesloe Beach (known locally as Cottes), which is located just 15 minutes west of the city. This wide crescent of powder-white soft sands boasts perfect conditions for swimming, sunbathing, surfing and snorkelling. During the summer these swathes of sand are patrolled by Cottesloe Surf Life Saving Club. Highlights: Towering Norfolk pines line a boulevard that tempts with trendy restaurants, stylish cafes and laid-back bars – perfect for afternoon chilling. For the best uninterrupted views of the Indian Ocean head to the colonial-style Indiana Tea House which serves coffee daily from 9am and offers all-day bistro dining from 11.30am until late. Art lovers visiting will enjoy Cottesloe’s Sculpture by the Sea exhibition, a free annual event held in March where the beach is transformed into a beautiful sculpture park. What: When it was opened in 1898 by the Governor of Western Australia, Lieutenant-Colonel Sir Gerard Smith, the zoo was the hailed ‘the showpiece of Perth’. Today Perth Zoo is an award-winning modern zoo that secures a safe habitat for a diversity of species. Its role is to support vital conservation and it is renowned for its successful breeding programmes for endangered exotic and native animals. The Zoo covers 19 hectares and is located a short walk from the Mends Street Jetty in South Perth. Highlights: Wonderfully re-created natural habitats include the Asian Rainforest, home to exotic primates, elephants, tigers and bears, the African Savannah, home to giraffes, rhinoceros, cheetahs, lions and baboons, and the Australian Bushwalk home to kangaroos, wallabies, cockatoos and the numbat, WA’s animal emblem. Two of Perth’s newest additions are also famously housed in the Zoo; a pair of baby short-beaked echidnas named Nyingarn (Nyoongar for echidna) and Babbin (Nyoongar for friend) were born in the zoo’s echidna breeding area in August 2012, marking a breeding milestone. Perth Zoo is daily from 9am to 5pm; admission costs £14.90 for adults and £7.50 for children. What: For a breathtaking bird’s eye view of the city’s landmarks, award-winning helicopter company Halwest offers three types airborne experiences. These thrilling aerial tours take place on the weekends between 10am and 4pm and depart from the helipad next to Burswood Casino. Passengers must arrive 10-15 minutes before the flight is due to leave for a safety briefing. Highlights: The Perth City Special costs £50 per person and takes flight along the Swan River, capturing stunning views of the city centre, Northbridge, King’s Park and Herrison Island. The Fremantle Flyer costs £119 per person and includes panoramic views of Perth and the historic port city of Fremantle. The Scenic Beach tour costs £199 per person and includes a flight over Perth, Hillary’s Boat Harbour, Perth’s beautiful beaches, Fremantle and the Swan River. For wannabe helicopter pilots, the company runs a pre-flight briefing and a 35-minute introductory flight lesson costing £232 per person which takes place at Perth’s Jandakot Airport.